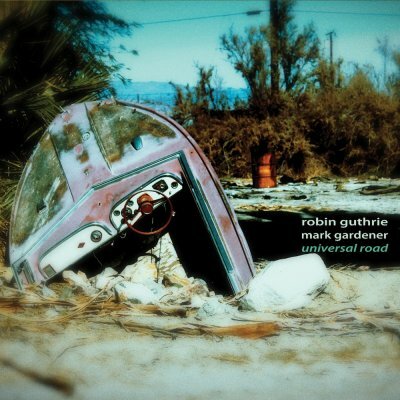 Universal Road is the new album by Robin Guthrie (Cocteau Twins) and Mark Gardener (Ride). Their former bands work ought to give hints as to where a collaboration between the pair might lead, but this remarkable new album has it’s own chemistry and is an unexpected treasure from the two well established artists. The pairing of Guthrie and Gardener might, at first glance, be expected to deliver a very particular brand of guitar-driven euphoria, however, Universal Road, defies expectations across ten tracks whose diversity is one of the album’s great strengths. This is a most harmonious collaboration, at times affirming – ‘Yesterdays News’, exuberant – ‘Dice’, reflective – ‘Sometime’, striking – ‘Old Friend’ and quietly epic – ‘Blind’. Gardener’s vocals have rarely sounded better than they do on Universal Road, his layered harmonies are a particular highlight. Guthrie’s lush sound and alluring guitar arrangements and melodies are seamlessly interwoven throughout, deftly accentuating the emotional content of the songs. Effortlessly assured, poised, and graceful, this an album whose many charms unfold and reward over repeated listens. At a time when fascination with the shoegaze movement of the late ‘80s and early ‘90s is enjoying a revival, whether it be through band reformations—including the forthcoming reunion of Gardener’s former band Ride—or adulatory documentaries—2014’s Beautiful Noise—it can be easy to acquire a form of nostalgic tunnel vision. Guthrie and Gardener’s Universal Road leads us in a fresh direction.